Filter out those bad dreams and sleep more soundly with a DIY dreamcatcher! Dreamcatchers originated with the Ojibwe Native American people, and gained in popularity and use during the Pan-Indian movement of the '60s and '70s. Some view the dreamcatcher as a symbol of Native American unity and identity, but it has a specific, poignant origin story: According to an ancient Ojibwe legend, there once was a Spider Woman known as Asibikaashi, who took care of the Ojibwe children and people. Caught Dreams Dream Catcher ~ Extra Large Black Crochet Boho, Hippie, Gypsy Style with Black 16 inch Diameter & 36 inches Long! IT'S SO STUNNING that we offer a 100% MONEY BACK GUARANTEE! 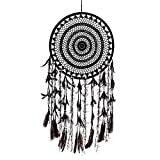 DETAILS - The Indian charm Dreamcatcher will look great on a wall or a chandelier. It must be hung in the room where you sleep to protect you against bad dreams. The dreamcatcher is made of a suede cord, a cotton thread, wooden beads, chicken and goose feathers.Copying of the product in different colors is possible. Ok, so this isn't a dreamcatcher in the traditional sense at all. But it's still a super cute idea — and dreamcatcher enthusiast must-do. Just 10 steps to create a classic-looking dreamcatcher. Who knows what kind of good vibes you'll ensnare! I had the hardest time finding metal hoops at my craft store, luckily I was able to find some online. Here's the ones I got for my dreamcatchers! Don't just think about it, Do It (Yourself)!